Macro examination is the procedure in which a specimen is etched and evaluated macro-structurally at low magnifications, typically x10 or lower. Macro examination is a frequently used technique for evaluating steel products such as billets, bars, blooms, and forgings. During macro examination, there are several procedures for rating a steel specimen by use of a graded series of photographs showing the incidence of certain conditions and is applicable to carbon and low alloy steels. 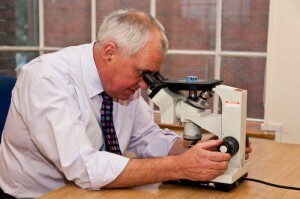 Macro examination can also be performed on a polished and etched cross-section of a welded material. During the macro examination, a number of features can be determined, including weld run sequence – important for weld procedure qualifications tests. In addition, any defects in the sample can be assessed for compliance with relevant specifications. Slag, porosity, lack of weld penetration, lack of sidewall fusion and poor weld profile are among the features that are searched for in such examinations. It is normal to look for such defects either by standard visual examination or at magnifications of up to 50X.